It's hard to be a stress free Bitcoin owner, isn't it? With volatility of crypto markets, amplified by barrages of exciting rumors or doomsday headlines it's easy to get swayed into inefficient trades, losing both on your BTC possession and its dollar value. Coin Signals provides the much needed confidence to individual crypto currency traders in form of strong, real time trading signals. The application receives updates from a live mechanical trading system performing actual trades following the same signals. Unlike other trader assistance products, Coin Signals gives specific, actionable advice based on best effort and continuous technical analysis of the market. You don't even have to keep an eye on the app! 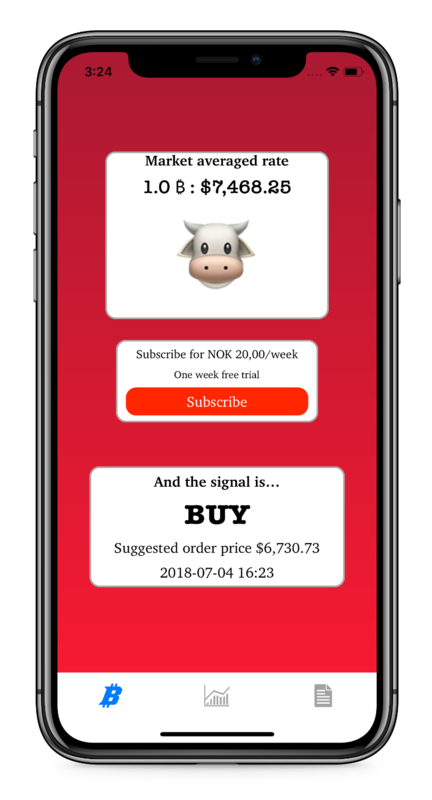 If you opt for instant notifications, you will be able to receive decisive BUY or SELL signal notices immediately. This ensures no true opportunity is overlooked and potential losses are mitigated. System performance can be evaluated on existing history of suggested trades, right within the application. As we don't show you the ads or collect your personal data, the app is one coffee worth a week to use. But the best part, you have a whole week to evaluate the app, before committing yourself! Subscription can be canceled at any time.